Remember my Box of Marble demo?. It was a native Qt/C++ application running on Maemo-powered Nokia N900. With the wave of DeviceOrientation Event Specification implementation, now it's possible to have the demo as a web app, running just inside the web browser. 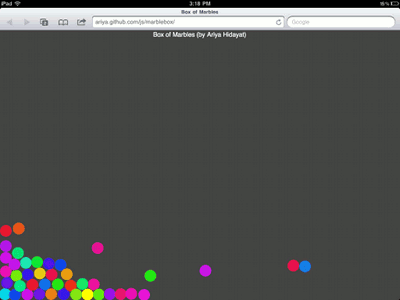 In fact, this is what you can see from this demo: ariya.github.com/js/marblebox. Right now, it works with iPhone or iPad or iPod Touch running the new iOS 4.2, due to the brand new DeviceMotionEvent support. If you own a MacBook with accelerometer and you use Google Chrome, that works as well (tilt your laptop to see the gravity effect). But fear not, with the recent support to hook the acceleration data from Qt Mobilty to QtWebKit, don't be shocked if the next Nokia phone with built-in QtWebKit sports this feature as well. works very weirdly on the macbook pro 2009, it gets _some_ accelerometer data, that is for sure, but the orientation of the marbles do not match the orientation of the macbook in any way. @Denis: Check http://ariya.github.com/js/accelerometer/ and see if the data matches the orientation (see also the W3C spec draft).